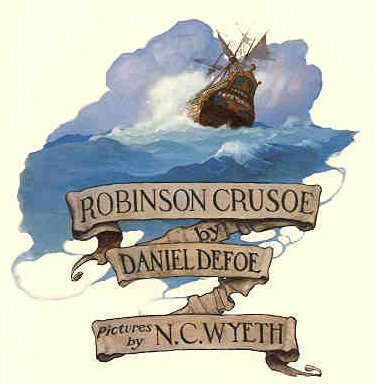 Now you can download the entire unabridged texts of both of Defoe's great Robinson Crusoe novels absolutely free! This plunder is yours for the taking. You can download it now, or if you're short on disk space, you can come here and read it online whenever you want. Robinson Crusoe is one of the world's most popular adventure novels. Daniel Defoe based his classic tale of shipwreck and survival on an uninhabited island is based on a true story. The real Robinson Crusoe was a Scotsman named Alexander Selkirk (or Selcraig). Born in 1676, when Selkirk was 19 years old he was cited for indecent conduct in church, but before he could be reprimanded, he ran off to sea. That was in 1695. By 1703 he was the sailing master of a galley. The following year he joined a pirate expedition to the Pacific Ocean that was led by Capt. William Dampier. Selkirk's ship had Thomas Stradling as it's captain. After spending some time in the Pacific and numerous raids on the Spanish towns and shipping, they were preparing to return to England with their booty. Their ship had suffered considerable damage in battle and Selkirk felt they needed to repair her before setting off around the Horn. The captain disagreed. After a heated argument and in a fit of anger, Selkirk refused to go any farther and demanded he be set ashore on the Island of Juan Fernandez, which was about 400 miles off the coast of Chile. This, the captain was glad to do. Once ashore, Selkirk realized the enormity of what he had done. He thought others in the crew would join him, but none did. He changed his mind and tried to convince the captain to take him back. The captain refused and Selkirk found he had marooned himself alone on an uninhabited island. Actually this was the smart thing to do since the ship later sank killing most of those aboard, but at the time he didn't know this. After about two years on the island he finally saw a ship and ran down to the shore to greet it. He realized almost too late that it was a Spanish ship and the Spaniards opened fire on him as he ran for cover. They were unable to find him and eventually left. He was much more cautious after that. Selkirk was able to domesticate some goats and cats he found on the island and these were his only companions though out his stay of almost 4 1/2 years. He was finally found in February 1709 by William Dampier, who was then pilot on a privateering expedition headed by Capt. Woodes Rogers. Rogers appointed Selkirk as ship's mate and later gave him command of captured ship. For the next two years they conducted raids on the coast of Peru and Chile. They even captured a Spanish galleon. Selkirk was very well-off when they returned to London in 1711, as his share of the booty came to £800--a sizable fortune in those days. Selkirk soon met essayist Richard Steele, who wrote up Selkirk's story and published it as "The Englishman" in 1711. Selkirk eventually returned to his home in Scotland, where he became quite a celebrity. Though he did get married, he never quite recovered from his stay on the island. Spending much of his time alone, he didn't feel comfortable living indoors and built a sort of cave or bower behind his father's house that he stayed in. He also trained two cats to perform little feats, like he did on the island. Eventually he returned to sea and he died of fever off the coast of Africa in 1721 at the age of 45. While some biographers say Defoe never met Selkirk, others say the two met at the house of Mrs. Demaris Daniel in Bristol, where Selkirk told Defoe firsthand of his adventures and even gave Defoe his personal papers. Either way, there's little doubt Crusoe is largely inspired by Selkirk. He may have also been in Robert Louis Stephenson's mind when he wrote of the marooned pirate Ben Gunn in Treasure Island. 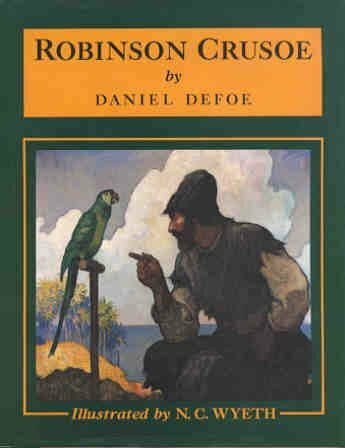 In the novel, Defoe extended Selkirk's 4 1/2 years on the island to Robinson Crusoe's 28 years. He also moved the island from off the coast of Chile far out in the Pacific Ocean to just off the coast of Venezuela. In relation to our main interest--which is pirates and piracy--before Crusoe is shipwrecked on the island he is captured by Moorish pirates from Sallee on the coast of Africa, but soon escapes. And while his rescuers are not exactly pirates, they are in the midst of a mutiny that Crusoe helps put down and brings them back to the straight and narrow. Even though Robinson Crusoe is a fictional character, like Sherlock Holmes he has crossed over from fiction to fact in the minds of some people. There are even people on the Island of Tobago who claim to be descended from Robinson Crusoe.